The WISC Test (Wechsler Intelligence Scale for Children) is an IQ test administered to children between ages 6 and 16 by school districts and psychologists. The objective of the exam is to understand whether or not a child is gifted, as well as to determine the student’s cognitive strengths and weaknesses. Since it’s an intelligence test, the WISC Test is either given one-on-one or online and doesn’t require any reading or writing skills. A child’s WISC results are compared to other children of in the same 3-month age group. The table below shows the age bands for the WISC-V. The WISC-V is the most recent version of the WISC test, but older versions (the WISC-IV and the WISC-III) may still be given. On the WISC-IV, each subtest is designed to begin at an easy level for the child. The psychologist will continue to ask the child questions until he misses 4 or 5 in a row. 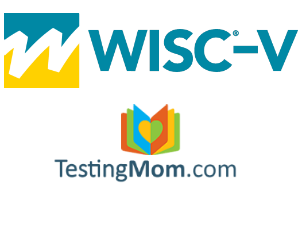 If you have a younger child who took the WPPSI™-III test or WPPSI™-IV test (the Wechsler Preschool and Primary Scale of Intelligence™), the WISC-IV test is the “upward” continuation of that test. There is a bit of overlap where a 6 to 7.3 or 7.7-year-old child could take either the WPPSI™-III or IV test or the WISC-IV test. A psychologist would determine which test would be appropriate for a child in that age range. Because an IQ test is so different from a skills or achievement test, it is harder to study for. Additionally, since it is given to children so young, there is a chance that a child might get scared or nervous and make mistakes that could cost him many points. Most children taking the WISC-IV test at age-7 are just beginning to learn how to take a test. They may not be good at sitting still for a long period of time, listening carefully to what is being asked of them, thinking through questions and looking at all the answer choices before jumping in to respond. Test-taking is an emerging skill set for younger (and many older) children. Developing these test-taking abilities is as challenging to young students, as knowing the answers to the questions they are being asked. For these reasons, we believe it is critical that (at the minimum) you give your child exposure to the types of questions that he or she will encounter on the test. By giving your child some familiarity with the kinds of questions and tasks, you will dramatically decrease his or her chances of making simple mistakes or becoming confused. A child taking the WISC-IV test receives a Full Scale IQ score, a Verbal Comprehension Index (a score based on verbal Items), a Perceptual Reasoning Index (a score based on performance or visual-spatial reasoning items), a Working Memory Index (a score based on working memory items), and a Processing Speed Index (a score based on how the child performs on timed portions of the test). Verbal items on a test are expressive and receptive language-based questions. Perceptual Reasoning items relate to items that target a child’s non-verbal or visual-spatial reasoning skills. These are items that don’t require language to solve them. Examples include items like recreating block patterns or solving matrix puzzles. Working Memory items are tasks where the student must remember something she just heard and then do something with that information. Unfortunately, this is not entirely true. Please consult your district or expert if you have questions about testing. Wisc III AND WISC IV should not be given. Once a new version comes out after one year the older one should be retired completely. Parents don’t bother trying to study for this test.